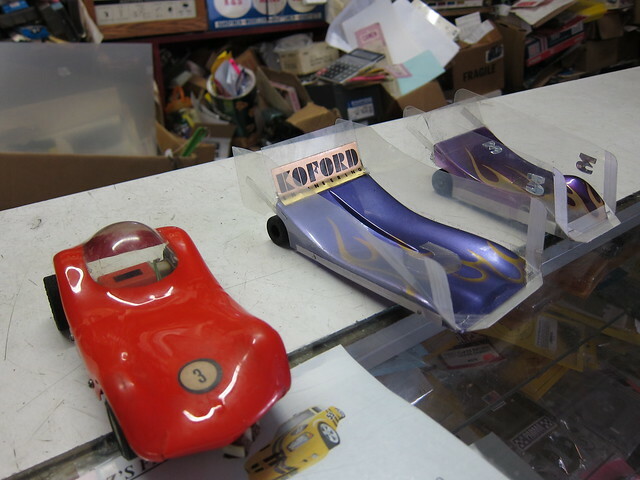 What better way to spend a hot, humid Sunday Brooklyn afternoon than checking out Buzz-A-Rama, a 1960’s era slot car parlor in Kensington? Inside this unassuming storefront are 4 or 5 large twisting tracks, where children and adults race cars about 3 inches wide by 6 inches long, much larger than the matchbox-sized slot cars I played with as a kid. Amateurs like us use slow cars rented from Buzz. The pros, however, bring their own custom lightning-fast cars and controllers, and they are quite serious about them. 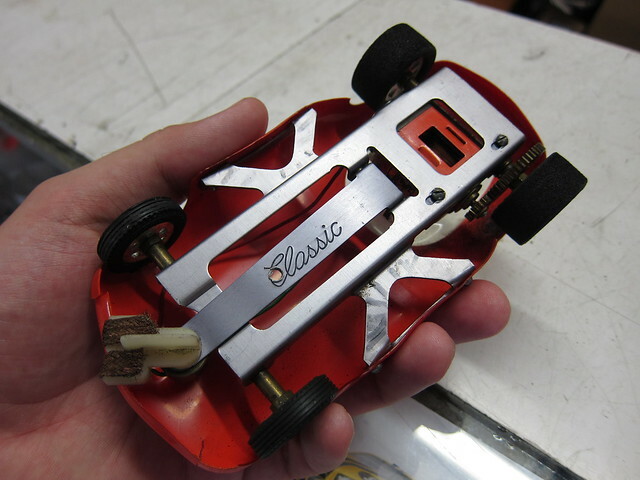 The car chassis are cut from lightweight aluminum composite using electrical discharge machining. Motivation is provided by high-performance brushless DC motors. Wheels and tires are made of special sticky, heat-resistant rubber, with a set of chemicals and rituals for cleaning and warm-up before a big race. The lightweight plastic body can be either an aerodynamic wedge shape that directs airflow up, forcing the rear wheels down for better traction, or a more traditional scale model of a production muscle car. Super-cool retro body styles are available as well. The controllers are also semi-custom built, and are adjustable by the operator to conform to his or her desired level of aggression in acceleration and braking. QRSS is a term used in ham radio to mean “very slow speed morse code”. QRPp means “using a very low power radio transmitter”. What happens when you combine these concepts? Small, simple, radios that can communicate over thousands of miles using about the same amount of power as a TV remote control. The radio shown above is based on a kit by Hans Summers, G0UPL, that I picked up at the Four Days in May QRP convention. It uses a single-sided circuit board, with three transistors, one crystal, five toroids, a basic microcontroller, and a handful of resistors and capacitors. I added a 5v regulator, an LED to show the keying activity, and put it in an Altoids tin. The whole thing probably cost about $25 in parts, and took one evening to assemble. After building it and tweaking it to get it on exactly the right frequency, I hooked it up to the dipole on the roof of NYC Resistor, and flipped on the power switch. My 100 milliwatt signal went up into the sky, bounced around between the ionosphere and the ocean a bit, and was picked up by a radio operated by Johan, ON5EX, in Belgium. He runs what is known as a “grabber” — a radio and computer combination that monitors the QRSS portion of the 30m band, converts the signals into digital spectrographic images, and publishes them on the internet. Here is a screen capture from Johan’s website shortly after I powered on my transmitter. It shows about 100Hz of spectrum (frequency is on the vertical axis) over 11 minutes (horizontal axis). My signal is in the center of the graph. It’s my call sign, W2VV, sent repeatedly in morse code (·–– ··––– ···– ···–) at about 10.140015 MHz. If you listened to this signal as audio, you would mostly hear static. The horizontal lines you see in the graph would come out as tones. The higher the line, the higher the pitch of the tone. My signal would sound like a tone that changes pitch ever so slightly up and down as the dots and dashes are sent. However my signal would probably be so weak as to be inaudible through the static. It is only discernible when converted to visual form and then compressed over a long period of time. Belgium is about 3600 miles away from New York, which means this transmission achieved an amazing power efficiency of 36,000 miles per watt. Also, it occupied just a tiny sliver of bandwidth — only 5Hz, meaning many other people could share the same range of frequencies without interfering with each other. However you don’t get something for nothing in life, and the tradeoff in this situation is that very little information was sent. It took six minutes just to send my four-character callsign. Still, that’s not a bad deal for a $25 radio that fits in your pocket. Visit my Flickr page for more photos of the build. Better yet, come to our Ham Party on Saturday and see it for yourself! And if you can’t make it to our place, visit one of the hundreds of other ham radio clubs across the country hosting public events this weekend in honor of ARRL Field Day. Inspired by the upcoming 2010 ARRL Field Day event, we finally got off our duffs and set up a real amateur radio station at the resistor clubhouse. We now have a 60 foot long dipole on the roof, an antenna tuner, a couple of transcievers (one 100W and one QRP), a CW key, and a TNC for using digital modes with a laptop. With a few hours of operating under our belt, our logbook shows contacts with stations in the US, Canada, Europe, and South America, using phone (voice), CW (morse code), and PSK31 (digital). The best part of our station is how little QRM (man-made noise) our antenna picks up. When we first put the station on the air, I thought something wasn’t hooked up right. Being in the middle of a densely-populated area, I expected to hear horrendous noise from power lines, AC motors, etc., but heard almost none. This makes tuning the bands a real pleasure. Our club callsign is N2YCR. If you hear us calling CQ, give us a call back. We’d love to talk to you! How do you keep an iPhone running for long periods of time when you are off the grid? You can’t change the battery in the phone, so carrying a spare isn’t an option. Devices like LadyAda’s excellent MintyBoost use AA batteries and can keep you going indefinitely, but unfortunately the MintyBoost and several other similar products don’t work with the iPhone 3GS. And anyway what I really wanted was a device that would take power from the high capacity 12V NiMH rechargeable pack that I use to power my portable ham radio gear. I could have re-purposed a charger meant for use with cars, but many of them use linear regulators and are therefore very inefficient, or aren’t compatible with the 3GS; plus they are overpriced. So instead I built a charger to suit my needs: the MintyBuck. I recently stumbled across a video podcast series on iTunes called EEVblog. It is a simple, low budget affair — just one guy with a camera set up on a tripod in his workshop, but the content is great. The host, David L Jones, is an electronics design engineer in Australia, and his ten minute episodes are chock-full of practical design tips about electrical engineering and product design. Apparently I’ve been living under a rock for quite some time, because this discovery has led me to several related video blogs that I didn’t know about either, including Ladyada’s Adacast and FatMan and Ciruit Girl. I can’t wait to check those out too. Are there any other video blogs I’m missing out on? Please comment below! This weekend is the Adventure Radio Society‘s annual Flight of the Bumblebees event. Amateur radio operators will be using portable low power stations from mountaintops, beaches, trails, parks, picnic tables, and backyards across North America. Many participants build their own equipment, either from kits or from scratch. Most stations are lightweight — a few pounds or even fractions of a pound — and yet many are capable of being heard thousands of miles away. All communication is CW (morse code) using no more than 5 watts. This event was my excuse to learn morse code. I have some iPhone apps (Dah Dit and HamMorse) that I use to kill time on the subway, and after a few weeks of practice I can now send and receive at a beginner’s level of 5 words per minute. Experienced CW ops go a lot faster than this, but most will gladly slow down to accommodate a novice like myself. I’ve already made a couple of contacts on the air and I’m looking forward to making many more on Sunday. Last weekend I threw my ham radio gear into a backpack and carried it to the top of South Beacon Mountain in upstate New York, along with with my friend Tom Tumino, N2YTF, and we spent several hours at the summit making contacts with other hams around the globe. Tom is a SOTA enthusiast who has introduced me to this great new aspect of amateur radio. The SOTA program (short for Summits On The Air) encourages hams to get out of the house and operate “mountaintop portable”. Peaks are ranked and assigned point values according to their prominence, with the idea that you want to collect as many points as possible by operating from as many high peaks as you can. The points aren’t good for anything except bragging rights, but it’s a nice incentive to get you out of bed at 7:00 am and on the road. SOTA is most popular in Europe where they have thousands of peaks cataloged. Here in the US, the program is just gaining momentum, and the administrators are still building the databases of eligible peaks. However there are many portable operators in the states and several other clubs that are active in mountaintopping independent of SOTA. Steve Galchutt wG0AT has created a great series of videos documenting his hikes on Mount Herman in Colorado with his two mountain goats Rooster and Peanut. HFPack is an active organization that focuses on portable and “pedestrian mobile” operations (i.e. backpack radios). Slightly more eccentric is the Polar Bear Club which encourages portable ops in the winter months. The photo above is of a 70 foot fire tower at the summit of South Beacon that we used as an operating base (you can see our antennas and a SOTA flag at the top if you squint). More photos after the break. A friend and I had dinner in the little Hudson River town of Beacon NY last night, after a day hike on nearby South Beacon Mountain. 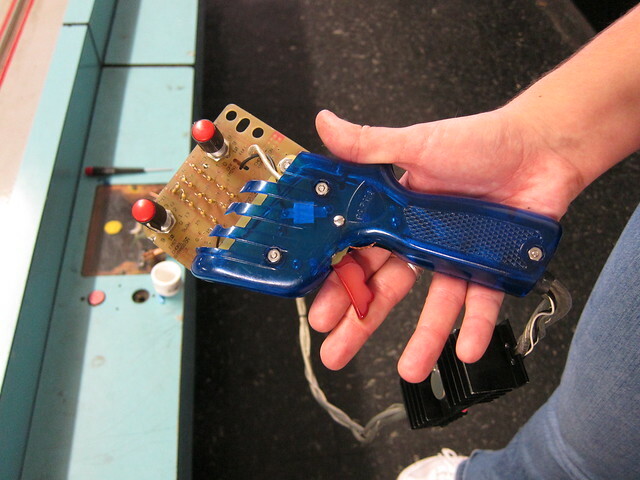 As luck would have it, Beacon is home to the Retro Arcade Museum. Despite the enticing name, we almost didn’t bother checking it out since it was fairly late, and from a distance the museum appeared to have closed down for the evening. What a mistake that would have been! Inside was the finest collection of classic arcade games, pinball machines, console and handheld games I have ever seen (not that I’ve seen a lot of these, but it was still *very* impressive). The owner, Fred, gave us the grand tour, which includes a hilarious party room in the back dubbed “grandma’s kitchen”, outfitted with yellow formica everything, just like your nana’s — perfect for hosting hipster birthday parties. We didn’t have time to play the games but for ten bucks you can enter the matrix and play anything you want for a full hour. And these are not a bunch of PacMan machines you could find on eBay. Fred has obviously done a lot of homework, and legwork, and acquired a number of very fine examples of early games, including many electro-mechanical ones and first-of-their kinds. It is truly a museum. Of awesome. Beacon is a 75 minute train ride from Grand Central, and the museum is a one mile walk from the train station. Aside from the museum, Beacon has a number of other cute shoppes and restaurants so this would make an excellent day trip for the whole family. I shall be back. Check out this little gem: a ham radio store in the heart of New York City! It’s called Barry Electronics, and you’ll be forgiven if you’ve never heard of it, since they don’t have a website, or a sign, and as far as I know they don’t advertise anywhere. What they do have is an ample stock of Yaesu and Icom radios, various aftermarket antennas, several shelves of radio books, and a bunch of other ham equipment. According to the proprietor (appropriately named Jonathan), most of their business is in commercial Motorola VHF/UHF radios, but most of their showroom is dedicated to ham equipment because the corporate customers aren’t interested in window shopping. If you want to visit, they’re at 224 W. 35th St. (between 7th and 8th Avenues), Suite 408.